Shortly after the end of World War II, key leaders in the state of North Carolina recognized the need to make some form of major investments to curtail the state’s fading economy. Out of this need was born the idea of creating a research and development park that could potentially leverage the science and engineering knowledge inherent in three of the state’s major universities; Duke University in Durham, the University of North Carolina at Chapel Hill, and North Carolina State University in Raleigh. This paper focuses on the establishment of such an entity, Research Triangle Park (RTP) located in-between the three universities, and how this park has stimulated the economic growth of the adjoining regions. The intent is to demonstrate that Research Triangle Park has promoted a wide range of economic benefits to the areas of Durham, Chapel Hill, Raleigh, and Cary since its establishment primarily because it serves as the core of a world-class innovation driven economic cluster that has directly promoted an increased global flow of goods and services. In 1776, Scottish moral philosopher and economist Adam Smith forever changed the world’s view on the key factors that effectively drive a nation’s and by extension the world’s economy with the publication his seminal work on modern economic theory, An Inquiry Into the Nature and Causes of the Wealth of Nations. Smith, in his treatise, articulated several beliefs that he felt were required in order to grow and sustain a nation’s wealth. Central to his theories was the belief that the flow of goods and services was absolutely required to sustain an effective economy and that anything that over regulates such flow or diminishes the inputs to the stream were detrimental to economic sustainability. To this end, much of Smith’s work concentrated on the factors that could potentially affect the dynamic nature of the production of goods and services (Library of Economics and Liberty). Today, Smith’s ground-breaking theories are more relevant than ever given the rebirth of a truer global economy over the last several decades. The ability for cities and their surrounding metropolitan areas to be agile and creative in the face of global competition has never been more important. To that end, this paper investigates the steps that one region of the country pursued to adopt the fundamental principles that Smith so eloquently articulated all the way back in 1776. From a rather dire position in the global economy in the post-World War Two era, the region in North Carolina bounded by the cities of Durham, Chapel Hill, and Raleigh banded together to create an economic entity, Research Triangle Park (RTP), that would allow this area to rise today to one of global competitiveness. For, without such a bold investment, North Carolina faced the prospect of watching the talented scientists, engineers, and technicians that were being produced by its three leading universities; Duke University in Durham, the University of North Carolina at Chapel Hill, and North Carolina State University in Raleigh leave the state for greener employment pastures. In early 2008, the National Research Council (NRC) of the National Academies tasked its Board on Science, Technology, and Economic Policy (STEP) to undertake a study to help characterize the role that investments in forming science and technology themed research parks play in stimulating regional and national economies. In March of 2008, the STEP, along with the Association of University Research Parks (AURP), sponsored a global symposium entitled “Understanding Research, Science and Technology Parks: Global Best Practices” recognizing that “a capacity to innovate and commercialize new high-technology products is increasingly a part of the international competition for economic leadership” and that “governments around the world are taking active steps to strengthen their national innovation systems” (Wessner, xiii). Central to the final report summarizing the outcome of the symposium was the recognition that “shared facilities, coupled with geographical proximity, can facilitate the transition of ideas from universities and laboratories to private markets” (Wessner, xiii). This belief was highly consistent with the findings of an earlier 2007 report issued by the National Academy of Sciences/National Academy of Engineering/Institute of Medicine which concluded that “the United States must compete by optimizing its knowledge-based resources, particularly in science and technology, and by sustaining the most fertile environment for new and revitalized industries and the well-paying jobs they bring” (Rising Above, 4). The ultimate goal in asking the NRC’s STEP to investigate the relationship between research parks and the innovation and creativity associated with knowledge-based research parks that can lead to economic stimulation was to better understand current United States policies relating to these types of institutions and steps that are being taken by other countries to enhance their global competitiveness by supporting their own research parks. To illustrate that the concepts and beliefs identified in the NRC’s STEP report are more than just theory, this paper explores the creation, establishment, and growth of one of the United States’ oldest research parks, Research Triangle Park (RTP), located in the heart of North Carolina. In addition to covering the history of the RTP, the paper will characterize the positive effects that the RTP has had on the region’s economy over the last several decades at both a local and global scale, while providing a summary of some of the negative aspects associated with RTP’s impact on the environment and infrastructure. Finally, the paper will summarize several of the key steps the RTP has planned and initiated to ensure continued success. From an historical perspective, cities and their surrounding metropolitan areas have played a vital role in fostering regional and national growth, primarily through trade, for thousands of years. Cities, not the nations that they reside in, are responsible for the majority of global commerce. Throughout history, before the rise of the nation-state, trade along routes like the Silk Road that connected cities from the Mediterranean to the heart of China, or the “medieval network of maritime trading cities” that served to link “Northern Europe’s Hanseatic League,” cities served as an integral part to enabling the earliest global trade (Berube and Parilla 2). What is unique about the creation of the RTP in North Carolina is that unlike the market-driven growth experienced by most U.S. cities, the idea for the creation of a primarily knowledge-based economic enterprise without existing commercial support to drive economic growth had never been accomplished before. So, what drove the need for such a unique venture in the years shortly after the end of World War II? The primary motivation was to support a southern economy that had started to become “very unstable” (Link, 2). Over the proceeding decades, the state of North Carolina had relied on three primary industries for the generation of revenue and source of jobs: the tobacco growth and manufacturing industry, the furniture industry, and the textile industry. Unfortunately, the sustainment of each of these three primary industries was now being threatened as furniture manufacturing was exiting the state and migrating to the northeastern U.S., textile manufacturers were experiencing stiff competition from Asian manufacturers, and the tobacco industry was losing jobs because of the introduction of more automated manufacturing processes combined with decreasing demand. The loss of jobs in these three sectors along with North Carolina’s already poorly ranked per capita income was making it increasingly difficult to retain the state’s recent college graduates. In 1952, per capita income for the continental states was $1,639, $1,121 for the states in the southern part of the country, but only $1,049 in North Caroline (Weddle et al, 3). To compound matters, the majority of North Carolina’s economy consisted of low wage manufacturing jobs. In response, members of the state’s academic communities initiated a dialogue in the early 1950’s with the state’s economic leadership in order to identify potential ways to rectify this bleak economic situation and attract new businesses to the state. From these discussions, the initial concept for the creation of a research park area supported by the regions three “triangle” universities, Duke University in Durham, the University of North Carolina at Chapel Hill (UNC-CH) in Chapel Hill, and North Carolina State University (NCSU) in Raleigh was born (Link, 2). Instrumental in the initial discussions to form a research park were the Treasurer of North Carolina, Brandon Hodges, the president of Wachovia Bank and Trust, Robert Hanes, and a local Greensboro builder, Romeo Guest, whom some credit with the initial idea to create such an entity. By 1954, the three had worked to secure the support of a number of influential members of the NCSU faculty and administration resulting in the school’s Chancellor, Carey Bostian to pitch the idea to then Governor, Luther Hodges. While not immediately being convinced of the value of the idea of forming a research park, Governor Hodges was willing to commission to study the concept. On January 27, 1955, William Newell, director of the Textile Research Center at NCSU delivered a report to the governor endorsing the idea of forming what at that time was referred to as the “Governor’s Research Triangle” (Link, 2). After obtaining the support of the UNC-CH president, Gordon Gray and the Duke University president, Hollis Edens, the Governor formed the first official entity associated with the RTP, the Research Triangle Development Council. After a first year under the leadership of Robert Hanes, control of the council passed to UNC-CH sociology professor George Simpson, who was tasked with seeking out companies to come to the research park. While Simpson worked with the three universities to develop material to help promote the park, and eventually met with over 200 companies, it became clear that in the absence of a physical entity, the concept was not attractive enough to secure enough interest to locate in North Carolina (Link, 3). In response, Governor Hodges and a variety of potential investors worked to secure land in the area between the three cities. Unfortunately, the required capital to secure all of the land required to establish the research park failed to be obtained, so in August of 1958, Hanes and Governor Hodges made probably the single most important decision related to founding the park when they secured the services of Archibald Davis of Wachovia Bank and Trust. For it was Davis that recognized that only by making the Research Triangle an entity for public service instead of for private gain would the park be successful in raising the needed development and operating capital (Link, 4). As a consequence of this recognition, the nonprofit Research Triangle Foundation of North Carolina was created and over only a two-month period in late 1958 raised $1.425 million to acquire both the land needed to establish the park and create as a focal point for the park, the Research Triangle Institute. It would be the job of the Institute to conduct research for government, industry, and business in addition to serving as the home of the Foundation (Link, 4). The first major firm to move into the research park was the Chemstrand Corporation, which relocated from Decatur, Alabama to the park in May 1959. While the going was slow in attracting additional companies over the next five years, 1965 was a pivotal year for the park, when on January 6, 1965 it was announced that the $70 million National Environmental Health Sciences Center would be constructed in the Research Triangle Park by the U.S. Department of Health, Education, and Welfare. Three short months later, International Business Machines (IBM) announced that it would build a 600,000-square foot research facility spread over 400 acres in the Park (Link, 5). Over the coming decades a host of companies, some world leaders and some small entrepreneurial start-ups, would help to make Research Triangle Park one of the greatest research parks in the world (Link, 5). 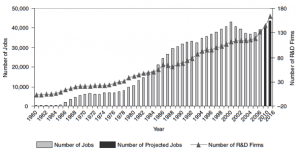 Figure 1 provides an historic overview of the number of jobs that have been created as a function of time in the RTP along with a near-term projection on potential job growth. Additionally, the graph shows the growth in the number of research and development related firms that have occurred since the Park was established (Weddle, 105). Finally, to cement the long-term existence and uniqueness of such a world-class research park, the president of the Foundation, Davis, worked in 1974 with the president of Duke University, Terry Sanford, and the president of UNC-CH, William Friday, and NCSU to create a “park within the park,” the Triangle Universities Center for Advances Studies, Inc. (TUCASI) (Link, 5). This move was facilitated by the Park becoming financially solvent during this period. TUCASI was specifically designed to foster an environment where faculty and students from the three associated universities could come together and collaborated with the RTP’s scientists and engineers. To facilitate the creation of TUCASI, the RTP Foundation created a 120-acre campus within the RTP (Weddle et al, 5). In 1976, TUCASI won a competition to house the National Humanities Center and today encompasses a number of other world-class entities such as the Microelectronics Center of North Carolina, the North Carolina Biotechnology Center (NCBC), the National Institute for Statistical Sciences (NISS), the Statistical and Applied Mathematical Sciences Institute (SAMSI), the Borroughs-Wellcome Fund, and Sigma Xi (TUCASI: A Brief History, 2-3). Today, Research Triangle Park is by far one of the largest research parks in the U.S. and ranks among one of the top parks in the world. Located on an approximately 7,000-acre development situated between the three cities of Durham, Chapel Hill, and Raleigh, RTP is home to more than 170 companies and employs over 39,000 full-time researchers (RTP Media Resources). An ongoing model of science and technology innovation and creation for decades, RTP is home to a combination of multi-national corporations, university derived businesses, and entrepreneurial financed start-ups working in the fields of agricultural biotechnology, biotechnology/life sciences, clean and green technologies, information technology, materials sciences and engineering, business and professional services, and financial and insurance activities. 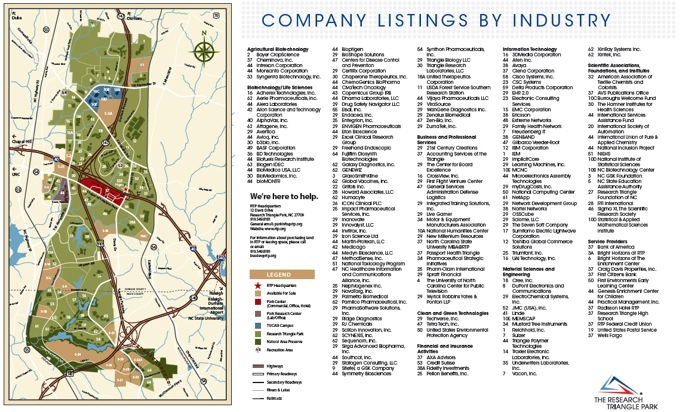 A map of RTP showing the location of a majority of the businesses in the Park plus a listing of companies by industry sector is shown in Figure 2. As was previously discussed, the degree to which investments in research parks yield a positive return on investment and the policies that should be enacted to enable such investments is an area of national interest given the nature of today’s global economy. The theory being that the establishment of a high-technology research park should support the agglomeration or clustering of advanced research and development firms that will eventually lead to economic growth. In 2004, a study by Scott Wallsten argued that, in general, science based research parks do not usually has a large positive effect on the economic growth of an area. One of the few exceptions specifically mentioned in this report was the Research Technology Park in North Carolina (Wallsten, 1). Although this economic stimulation took a number of decades to be realized, RTP has had a substantial impact on the economic growth of the Research Triangle including Durham and its surrounding counties. Knowledge externalities: the high concentration of interrelated activities in a limited geographic area facilitates the intentional and unintentional spread of information and knowledge (Berube and Parilla 10). By choosing to make an investment in RTP, North Carolina as a whole, and specifically its Research Triangle region have greatly benefited. In order to characterize the positive impact that the RTP has had on the region, it is important to establish an understanding and definition of what the “entity” is that should be evaluated. While in the past, it was potentially acceptable to present key statistical information such as population size and Gross Domestic Product relative to just the incorporated portion of a major city, it is best today to characterize such information in terms of the total metropolitan area. Over the last fifty to seventy years, while there has been a large decline in most cities’ population, there has been a corresponding increase in the number of residents living in a city’s respective surrounding metropolitan areas. As identified above, it is vitally important today to be able to characterize the behavior of not only the core city, but the metropolitan area in order to characterize an agglomeration driven economy. Fortunately, one is aided in this definition through the establishment by the U.S. Office of Management and Budget (OMB) of a set of accepted Metropolitan Statistical Areas (MSAs). Standard definitions of metropolitan areas were initially established in 1949 by the precursor to the OMB, the Bureau of the Budget. According to their website, the U.S. OMB defines a MSA as “that of a core area containing a substantial population nucleus, together with adjacent communities having a high degree of economic and social integration with that core” (2011 National Data Book: Appendix II – United States Census Bureau). In order to qualify as a MSA, it must have at least one urbanized area of 50,000 or greater inhabitants. A graphic showing the geographical areas of the two MSAs, Durham-Chapel Hill, NC MSA and Raleigh-Cary, NC MSA, that encompass Research Triangle Park and the three associated universities is shown in Figure 3. Table 1 provides a listing of the Durham-Chapel Hill, NC Metropolitan Statistical Area broken down by its associated “component counties” with their corresponding populations as of 2009, while Table 2 shows the equivalent data for the Raleigh-Cary, NC MSA (2011 National Data Book: Appendix II – United States Census Bureau). 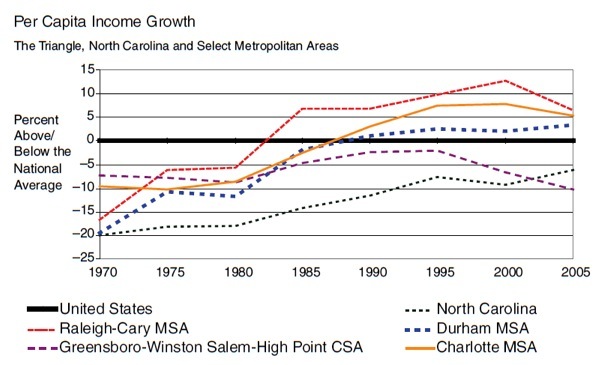 Finally, Figure 4 shows the significant growth in the overall populations of both the Durham-Chapel Hill MSA and the Raleigh-Cary MSA from 1969 through 2011 (U.S. Department of Commerce’s Bureau of Economic Analysis). An initial comparison of Figure 1, showing the rate of growth in the number of jobs in RTP, with Figure 4, showing the overall rate of growth in the two MSA, indicates that there is a potential positive relationship in the peak growth rate experienced by both in the mid-to late 1980’s timeframe. While not all of this population growth is directly related to science and research related jobs in RTP, it can be argued that a large portion of this growth comes from the associated ancillary jobs, such as teachers, city works, police, and service sector jobs that help support RTPs employees. 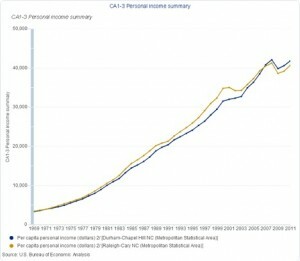 Besides just an increase in overall population in the Durham-Chapel Hill and Raleigh-Cary MSAs, Figure 5 illustrates that a measurable increase in the per capita personal income of both MSA’s inhabitants was experienced from 1969 through 2012 with a slight drop in the 2007 to 2009 timeframe most probably associated with the Great Recession (U.S. Department of Commerce’s Bureau of Economic Analysis). Figure 6 shows that a comparable increase in the Gross Domestic Product was also experienced by the two MSA’s during this same period of time. This is significant as it reinforces one of Adam Smith’s basic tenants that economic flow, in this case as measured by an increase in products and services (GDP), is vital to the economic sustainability of a nation, and that in this case much of that flow can be attributed to the innovative nature of RTP and its associated universities (U.S. Department of Commerce’s Bureau of Economic Analysis). 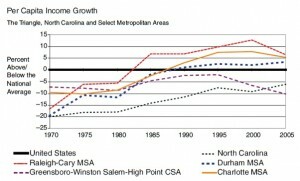 It is also clear from Figure 7, that during the period from the late 1980s through 2005, the Durham-Chapel Hill MSA, along with the other RTP influenced MSA, Raleigh-Carey, experienced per capita personal income growth that far exceeded North Carolina as a whole and the national average (Weddle, 106). While not all of this growth can be solely attributed to the establishment and growth of RTP, it is clear that residents of the Research Triangle area greatly benefited economically from the creation of approximately 40,000 high paying research and technology specific jobs. In addition to the 40,000 jobs created within the RTP, the area has experienced a number of direct and indirectly related economic benefits including construction jobs, real estate tax yields, sales tax yields and income tax yields. Additionally, studies have shown that since 1970, greater than 1,500 companies have been established in the Triangle Region as a direct result of supporting the work done by companies inside RTP and the three associated universities (Weddle et al, 7). What has enabled much of this growth is a fundamental shift in the types of companies that were established within RTP. Prior to the existence of RTP, less than 15% of the businesses in the counties around RTP; Orange, Wake, and Durham, were involved in what were designated as “New-line” industries. That is, industries dealing with electronics, communications, engineering and management services, chemicals, and business and education services. As RTP grew, so did the percentage of new-line businesses, from 30% in 1966 to 51% in 2005 (Weddle et al, 6). Much of the economic growth success of RTP and the surrounding area has been attributed not only the number of firms with RTP, but the nature of the businesses that those companies are involved in, thus allowing them to compete on a global basis. 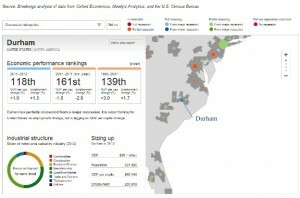 Finally, data from the Brooking Institution’s Global Metro Monitor for the years 2012 and 2013 has been used to assess the Raleigh-Cary MSAs economic recovery on a national basis and the Durham-Chapel Hill MSA’s and Raleigh-Cary MSA’s economic performance on a global basis (Note: Metro Monitor national ranking data for the Durham-Chapel Hill MSA was not available as only data for the top 100 MSA’s in terms of population is currently produced). The Brookings Institute specifically developed the Metro Monitor to allow for a more visual understanding of the economic recovery of major MSAs from the Great Recession. Although the recession was given an official end date of June, 2009, the U.S. has three million less jobs today than when the recession began toward the end of 2007 (Friedhoff and Kulkarni). 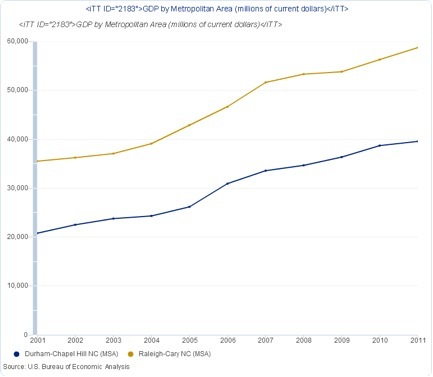 From an economic recovery perspective, the Global Metro Monitor tracks and assesses the economic performance of the 100 largest U.S. metropolitan areas since the 2004 timeframe using for key metrics; total employment, unemployment, total output (GDP), and housing prices (Friedhoff and Kulkarni). 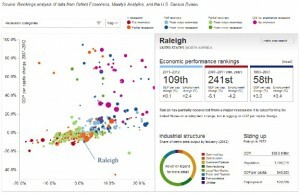 The most recent March, 2013 data shows that the Raleigh-Cary, NC MSA (Figure 8) has experienced a relatively good recovery in term of overall economic recovery over the period 2004 – 2012. 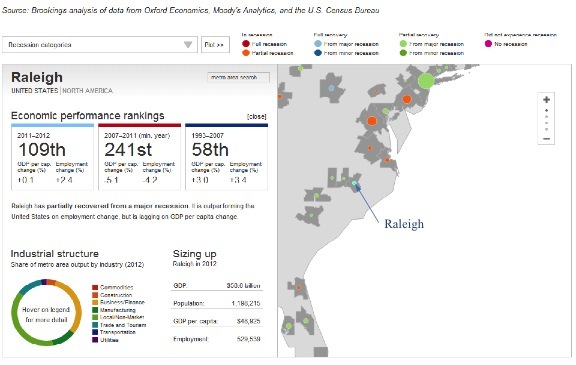 The Raleigh-Cary MSA is currently ranked 29th in terms of overall economic recovery, leading the Brooking Institution to conclude that the Raleigh-Cary MSA has fully recovered from a major economic depression. Paradoxically, while job growth for the area is very strong (ranked 13th nationally), unemployment in the area is still relatively high compared with many other major MSAs. In addition to an assessment of national economic recovery, the Brooking Institution also ranks each of the top 300 global metropolitan areas in terms of economic growth data, including real GDP and employment change. 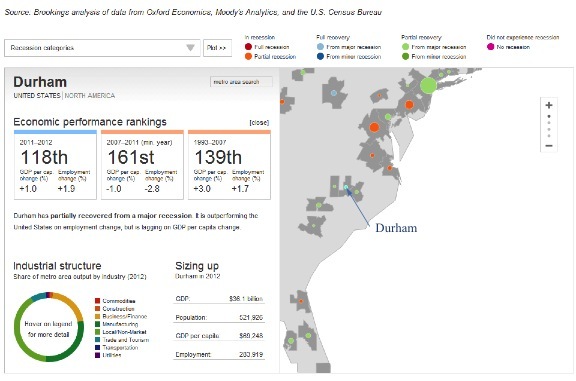 Currently, the Durham-Chapel Hill MSA ranks 118th (Figure 9) in the world in overall economic performance, while the Raleigh-Cary MSA ranks 109th (Figure 10). While the Durham-Chapel Hill MSA shows improvement economic performance when compared with the period 1997 – 2007, the Raleigh-Cary MSA still has not returned to the level of economic performance that it demonstrated during the 1997 – 2007 timeframe (Istrate and Nadeau). Finally, Figures 11 through 14 provide further insights on the economic recovery of both of the MSAs. From Figure 13, it is clear that both MSAs have experienced positive employment and GDP per capita growth from 2011 through 2012. Conversely, from Figure 14 it can be seen that while both MSAs have improved from an employment change perspective relative to the rest of the country over the last couple of years, both areas are slightly lagging the rest of the U.S. in terms of GDP per capita change over that same time period. In February of 2013, the Metropolitan Policy Program at the Brookings Institute conducted a comprehensive, first of its kind analysis of patenting activity and trends on a national scale (Rothwell et al). The report covers patenting trends on a regional level during the period 1980 up to 2012. The report focused on investigating the invention as a measure of economic growth while trying to establish an understanding of why certain areas are more creative and innovative than others. Patents produced under U.S. government funded research activities tend to be of very high quality. (Rothwell et al, 1). 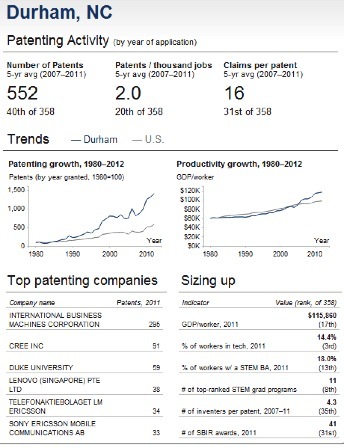 Given these findings, it is no real surprise to find that both the Durham-Chapel Hill MSA (40th of 358 MSAs) and the Raleigh-Cary MSA (19th of 358) both rank extremely high in terms of the average number of patents developed per year during the period from 2007 – 2011 (Patenting). Both of the region’s two MSAs have striven to develop tight relationships with their world-class research universities, while these schools had striven to develop and maintain close partnerships with the leading research and development companies in the Research Triangle area. All of this effort has clearly paid off in terms of producing an innovative and creative workforce that serves to stimulate the regional economy by making the firms they work for competitive on a global basis. 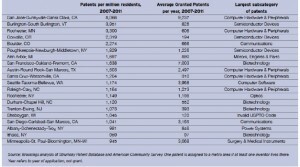 Figure 16 shows the relative number of patents produced per worker for most of the major U.S. metropolitan areas. 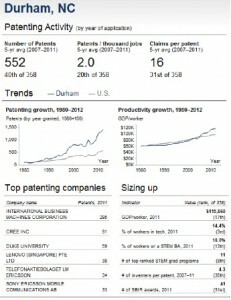 Figure 17 shows the specific patenting activity for the Durham-Chapel Hill, NC MSA in terms of several key indicators including the number of patents, patents/thousand jobs, patenting growth for the area relative to the entire U.S., and the top patenting companies in the area. Figure 18 shows the same information for the Raleigh-Cary MSA. Finally, Tables 3 and 4 list the top twenty patenting companies for the Durham-Chapel Hill MSA and the Raleigh-Cary MSA, respectively. 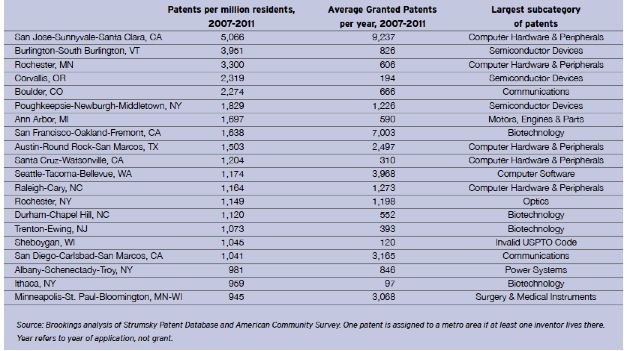 Potentially the most telling fact, as shown in Table 5, is that both of the MSAs associated with RTP are in the top twenty MSAs in America in terms of Patents per Million Residents for the period from 2007 – 2011 (Rothwell et al, 14). 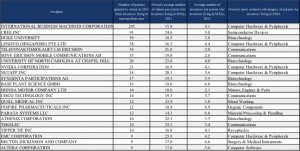 Another way to interpret this information is that if one viewed the productivity of the two RTP related MSAs as one joint enterprise, then the Research Triangle area would rank fifth overall on that same list, making the combined area on of the most powerful engines for innovation in the world. Clustering: the critical mass of diversified businesses with their highly skilled scientists and engineers has enabled RTP to form a knowledge-based cluster that has demonstrated the ability to leverage these skills in innovative and creative ways to sustain long-term economic sustainability and growth. 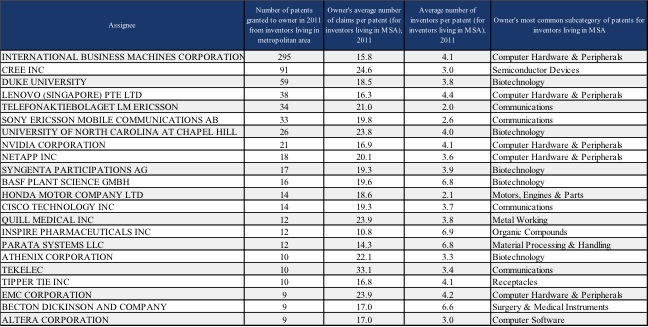 As shown in the recent Metropolitan Policy Program study on patent trends, the two MSAs associated with the Research Triangle Park both reside in the top twenty for Patents per million residents (Rothwell et al, 14). This is a clear indication that the concentration of talent in the Research Triangle area is extremely effective at creating new ideas, which as the patent study indicates is essential for economic growth. Commitment: there has been a long-term commitment on the part of both state and regional leadership that has allowed RTP to flourish (Weddle et al, 8). Without this kind of balanced leadership commitment between government and industry an economy runs the risk of either becoming stagnant or resorting to means that run contrary to a free trade economy. While both MSAs clearly suffered during the most recent economic downturn, the Great Recession of 2008 that was initiated by “flawed government policies and reckless and unscrupulous personal and corporate behavior in the United States,” various assessments have concluded that both Durham-Chapel Hill and Raleigh-Durham have taken steps toward a healthy recovery (Stiglitz). Clearly, beyond the economic benefit that RTP has provided to the area, the worth of the knowledge contained in the Research Triangle areas’ libraries and museums, the beauty in their orchestras, musical and theater companies, the spirit associated with their collegiate football, basketball, and other sports teams must all be accounted for lest we forget that the most important part of a city is the humans that walk their streets and parks. As Jane Jacobs noted in her monumental work on urban environments, The Death and Life of Great American Cities, “dull, inert cities, it is true, do contain the seeds of their own destruction and little else. But lively, diverse, intense cities contain the seeds of their own regeneration, with energy enough to carry over for problems and needs outside themselves” (Jacobs). It is clear that the cities of Durham, Chapel Hill, Raleigh, and Cary have all striven over the last several decades to be more than dull with the hope that their residents continue to do so. Jacobs, Jane. The Death and Life of Great American Cities. New York: Random House, 2011. Print. Smith, Adam. An Inquiry Into the Nature and Causes of the Wealth of Nations. Indianapolis: Liberty Fund, 1982. Print. Stiglitz, Joseph. Freefall: America, Free Markets, and the Sinking of the World Economy. New York: W.W. Norton & Company, Inc., 2010. Print. Since its establishment in 1959, the Research Triangle Park (RTP) has been a prominent fixture in the regional economy. North Carolina’s historical textile, tobacco and furniture industries experienced significant decline in the decades following the Second World War, and many jobs were lost in what is now the Research Triangle area (Link and Scott 2003). In the 1950s, several figures in state and local government, business and academia began to discuss development plans to increase employment and diversify the regional economy (Link 1995). The culmination of these efforts was the RTP, a complex that would focus on burgeoning high-technology industries. The RTP “began” in earnest in 1959, when the Research Triangle Institute and the Chemstrand Corporation located in the park (Link and Scott 2003). Since then, the RTP has grown significantly. The RTP’s success can be measured by the total number of firms that occupy the park and by the total employment of these firms. Both of these metrics have generally increased throughout the past five decades. Today, the RTP houses 178 firms that cumulatively employ over 39,000 workers. Analysis of the composition of RTP firms reveals a trend whereby most recent entrants to the park are smaller firms with relatively few employees. The RTP’s success as a regional employer and engine of economic growth is also suggested by secondary metrics such as the growing average income in the area since the park’s creation. The RTP’s substantial growth over its five-decade existence can be examined by considering the park as an agglomeration economy. The park has grown by attracting firms that specialize in high-technology fields. As the number of firms specializing in similar fields has grown, so have the agglomeration advantages of the RTP. Yet despite the RTP’s past successes as a regional employer and engine of economic growth, questions exist about the sustainability of its suburban industrial cluster model moving forward. 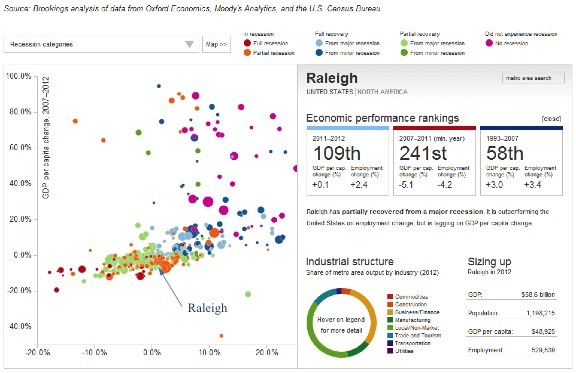 The RTP can be viewed as an agglomeration economy that specializes in high-technology industries, particularly in the life sciences and information technology (see Figure 6). Alfred Marshall (1890) claimed that economic clustering provides benefits in terms of labor pooling, information flow and access to specialized inputs. Saxenian (1994) proposes that agglomeration economies are particularly important for high-technology industries. Through physical proximity, scientists, engineers and managers can develop localized networks for efficient information sharing and innovation. Jenkins et al (2008) argue that the agglomeration effects of research parks are significant and are responsible for increasing the proportional growth of jobs in high-technology industries. One of the RTP’s prominent agglomerative features is the high level of educational attainment of the park’s employees and of the residents of the Triangle region more broadly. Forty-six percent of the workforce in the 13-county Triangle area held college degrees in 2011, well above the national and state averages of 36% and 26.5%, respectively (US Census Bureau 2013). Moretti (2003) finds that for each one-percentage increase in the share of college degree holders in a MSA, the average wage for all workers rises by between 0.6 and 1.2%. Glaeser and Saiz (2003) find evidence that highly skilled cities, where a high percentage of workers have college or advanced degrees, are becoming more productive and growing faster than less-skilled cities. The authors cite the importance of human capital in allowing cities to “reinvent” themselves and adapt to economic change. The Triangle region illustrates aspects of such a “reinvention city,” having transformed itself in a half-century from an economy predicated on cigarette, textile and furniture manufacturing to a highly educated technological hub. Goldstein (2005) argues that it has been the development of the Triangle region’s knowledge infrastructure that has transformed the area in recent decades. He reasons that the success of the RTP owes much to the three prominent research universities in the area – Duke University, UNC-Chapel Hill and NC State University. RTP firms and these universities have mutually benefitted from one another’s presence, with firms gaining research experience and universities learning how to better commercialize their own research. Kodrzycki and Muñoz (2009) find that leadership and long-term collaboration between the public and private sectors are essential for the economic revitalization of post-industrial areas such as the Triangle region. Several studies (Link 1995 and 2003, Rohe 2011) emphasize the creative leadership and close cooperation between private industry, the Triangle’s three leading universities and local and state government that has allowed the RTP to thrive. Sternberg et al (2010) describe the RTP as a cluster driven by the private sector but dependent upon cooperation with state government and several regional nonprofit organizations, such as the Research Triangle Foundation (RTF) and Research Triangle Regional Partnership (RTRP). Goldstein (2005) emphasizes the importance of public sector investments for attracting firms to the RTP, citing in particular the expansion of the Raleigh-Durham International Airport and Interstate 40. However, there is much literature that questions the efficacy of industrial clustering in today’s rapidly changing economic climate. Ioannides et al (2008) predict that increasingly cheap and efficient information sharing, particularly due to the Internet, will lead to more spatially diffuse economic activity. The authors also predict that larger cities will experience more rapid economic and population growth than smaller cities, as larger cities typically have more robust consumer amenities and are thus more attractive to young professionals. These predictions imply that isolated suburban clusters such as the RTP may be outmoded economic engines in the future. Moreover, in a comparison of numerous counties similar in terms of population and high-technology employment, Wallsten (2004) finds that research parks typically exert no positive effect on regional economic development. Analyzing high-technology clusters in Texas, De Silva and McComb (2011) find that positive locational effects exist for firms in the same industry located between one and 25 miles apart. Locating within one mile of a same-industry firm, on the other hand, correlates with increased firm mortality. In contrast to these skeptical prognoses on the merits of high-technology clustering, Weddle et al (2006) contend that the RTP has exerted substantial economic spillover effects beyond the park’s boundaries. The percentage of firms engaged in “new-line” industries, including chemicals, electronics, communications, business services and engineering, rose from 15% at the time of the RTP’s founding to 51% in 2001. The authors attribute growth in these sectors to the presence of RTP firms engaged in new-line industries. In sum, vastly different opinions exist in the literature on the efficacy of industrial clustering. The economic growth of the RTP can be viewed in terms of the number of firms that have located in the park over time. As shown in Figure 1, the number of RTP tenants has steadily increased by the decade. As of January 2013, 178 firms are located in the RTP, up from 21 at the end of the 1960s. The number of firms nearly doubled, from 21 to 38, in the 1970s. The park experienced its most significant numerical increase in tenants between 2000 and 2007, adding 45 firms in this period. 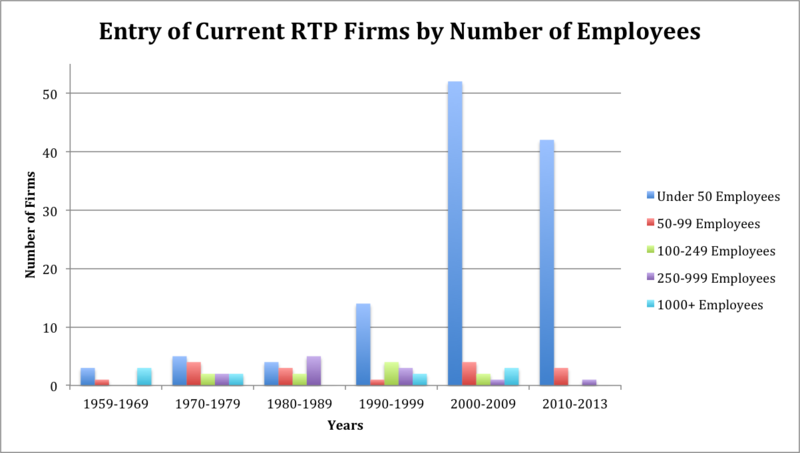 Figure 2 shows patterns of RTP firm entry over time according to current number of employees. 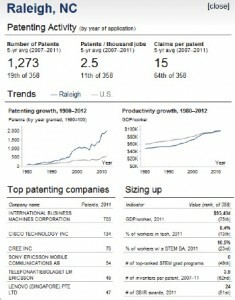 Data were available for 168 of the 178 firms currently located in the RTP. Of these 168 firms, 120, or over 70%, have fewer than 50 employees. The vast majority of firms that employ fewer than 50 entered the RTP recently: over 88% of these firms have entered since 2000, with 35% having entered since 2010. Firms with small workforces display the most temporally skewed entry pattern. Of the 16 firms employing between 50 and 99 workers, half entered the RTP before 1990. Of the ten firms employing between 100 and 249, four entered before 1990. Seven of the 12 firms with 250-999 employees entered before 1990. Half of the ten largest firms with over 1000 employees entered before 1990. While they represent a far smaller sample size, larger employers have entered the park with a far more even temporal distribution than firms with employment below 50. Historically, as the number of firms housed in the park has grown, so has the park’s total employment. Today, the RTP’s cumulative full-time employment stands at around 39,000 (RTF). As shown in Figure 4, total RTP employment increased annually with only one exception in the years from 1960 to 2000. Total employment has grown with something of a bi-sigmoidal distribution, with rapid increases in the mid-1960s and again in the early to mid-1980s. The significant employment increase from 1965 to 1966 is due to the entry of IBM and what is now the National Institute of Environmental Health Sciences (NIEHS), both of which were and remain very large employers (Link and Scott 1995). The 1980s oversaw a tripling in employment in the park, from just over 10,000 at the beginning of the decade to well over 30,000 by the end. However, beginning in the early 2000s, total employment declined from a peak of over 43,000 employees to around 37,000. In this period, the RTP and the surrounding region experienced an acute decline in the telecommunications industry. Nortel Networks in particular was responsible for a large number of lost jobs in the RTP. The firm had over 8,500 RTP employees in the late 1990s, but cut RTP employment to 1,850 by 2009, when Ericsson acquired the struggling company (Rohe 2011). In the formative years of the RTP, developers pursued a recruitment strategy aimed at large corporations (Rohe 2011). The entry of IBM, NIEHS, Glaxo (later GlaxoSmithKline) and the EPA were major boons for the RTP in its early years. Large firms still feature prominently in the RTP. Currently, IBM and GlaxoSmithKline employ some 10,000 and 4,500 workers respectively (Greater Durham Chamber of Commerce). However, a large and increasing number of current RTP tenants are smaller employers. As shown in Figure 5, 43% of RTP firms in 2013 have fewer than 10 employees. Sixty-two percent of firms employ fewer than 25, and 71% employ fewer than 50 workers. Figure 6 illustrates the industries in which current RTP firms specialize. Biotechnology/life sciences dominate, with 45% of firms involved in these fields. A further 18% of RTP firms are engaged in information and communication technology. The RTP has attracted firms in these industries throughout its existence. Of the 24 current tenants that entered the park by 1979, 10 specialized in biotechnology/ life sciences or information and communication technology. Data on the Triangle region indicate a correlation between the park’s growth and regional economic success. 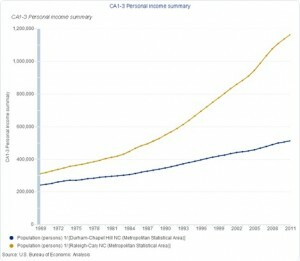 Since the establishment of the RTP, income in the area has grown considerably compared to state and national averages. 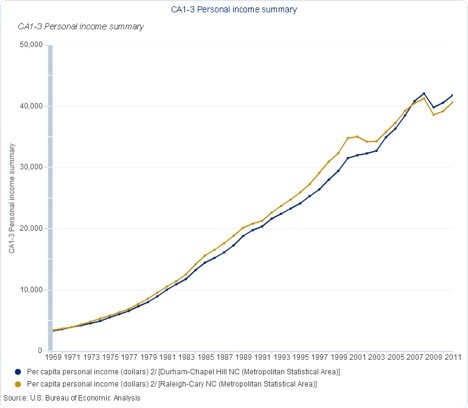 In 1969, when the RTP housed 21 firms, average per capita income was 86% and 89% of the national average in the Durham-Chapel Hill and Raleigh-Cary MSAs, respectively (Figure 8). 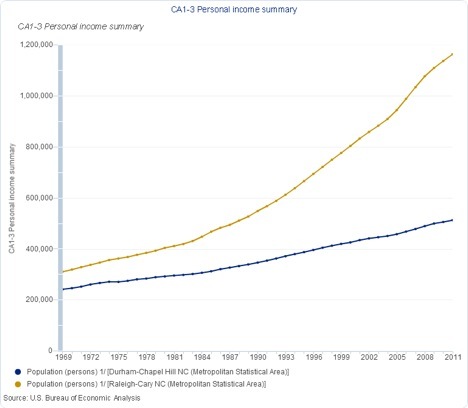 Relative per capita income peaked for the Durham-Chapel Hill MSA in 1993, at 105% of the national average, and for the Raleigh-Cary MSA in 2000, at 115%. In 2007, these figures were 104% and 102%, respectively. Though a crude metric that fails to discern between employees of different firms, the average salary for an employee of an RTP company was $56,000 in 2004. This figure is 45% above the national average and roughly 30% higher than the average income for both the Durham-Chapel Hill and Raleigh-Cary MSAs (Weddle et al 2006). The increase in the number of firms occupying the RTP over time is a testament to the agglomeration effects from which the park benefits. As the number of tenant firms specializing in a certain field has grown, the RTP’s agglomeration effects have in turn increased. Agglomeration effects are especially pronounced for RTP firms specializing in biotechnology/life sciences, with around 80 firms operating in this sector today. The RTP benefits significantly from the abundance of well-educated professionals in the regional labor pool. Highly educated workers are essential to the RTP: in 2006, five percent of the RTP’s employees held a PhD (Weddle 2006). In 1998, one-quarter of new professional employees hired by RTP firms held degrees from UNC-Chapel Hill, Duke or NC State University (Link 2002). According to Rohe (2011), these universities have cooperated increasingly with RTP firms to commercialize research since the 1980 Bayh-Dole Act. Data show a pattern whereby smaller firms that employ relatively few workers have tended to enter the park more recently. Additionally, there appears to have been a great deal of firm turnover in the RTP in recent years. While direct data on firm exits from the RTP was not available, secondary analysis of firm entry indicates significant turnover. Though entry data for 10 firms are missing, of the 21 firms housed in the RTP by 1969, only 7 are currently listed as tenants. Of the 38 tenants housed by 1979, 22 remain. Thirty-six of the 70 firms housed in the park in 1989 remain. Sixty of the 112 firms housed in 1999 remain, as do 122 of the 157 firms located in the park by 2009. Currently, the RTP houses 178 firms, up from 157 in 2007. However, 63 firms entered the park between 2008 and 2013. Again, the implication is that numerous firms must have left the RTP over this period. It is likely that many of these exiting firms were start-ups nurtured in the RTP that then left the park. Indeed, according to the RTF, the five incubators and business accelerators in the RTP have helped establish over 250 start-up and spin-off firms over the years. Goldstein (2005) notes that the RTP has had considerable success in creating spin-off firms in the past two decades, but has failed to catalyze the growth of larger high-technology facilities beyond the park’s boundaries. It appears that the trend whereby smaller firms comprise a higher percentage of the RTP’s total tenants reflects a desire on behalf of planners to attract start-ups. On its website, the RTF prominently advertises the park’s five incubators and business accelerators, which currently nurture “nearly 80 start-up and early state companies.” The RTF states that flexible, cost-efficient leases are available for start-ups, and specifically for start-ups that have emerged from university research. This strategic emphasis on attracting smaller firms may be partly due to the fact that only 700 acres are free for development in the park (RTF). Nonetheless, in the RTF’s 2012 “Master Plan” for future development of the park, leaders called for a continued effort to maintain existing large firms in the RTP as well as to attract new large firms. The plan proposes that the park further diversify its tenants by industry and size to ensure the RTP’s continued success. The campaign to attract start-ups also likely recognizes increased competition for attracting large firms, as well as changes in overall corporate strategies for research and development. Depillis (2012) argues that many large companies are reluctant to make the costly long-term investments in permanent infrastructure that they did in the RTP’s infancy. Instead, firms increasingly prefer to lease space for projects on an ad hoc basis. Depillis also suggests that the RTP’s isolated, sprawling complexes are unappealing to many young professionals. To address changes in employee preferences, the RTF has called for a renovation of the park that will implement residential and commercial spaces (Rohe 2011). However, in addition to requiring substantial changes in zoning laws, this plan has met with doubts that employees, especially young professionals, want to live and work in a suburban business campus. The growth of the RTP in terms of the park’s number of tenants and employees over the years has indeed coincided with economic growth in the Triangle region (Figures 7 and 8). Average wages have risen, unemployment has remained below national and state averages and population has increased (Rohe 2011). Weddle et al (2006) argue that the growth of the RTP has exerted spillover effects that have spurred the growth of new-line industries in the counties surrounding the park. Total employment in the seven counties closest to the park increased by nearly 700,000 between 1970 and 2006. 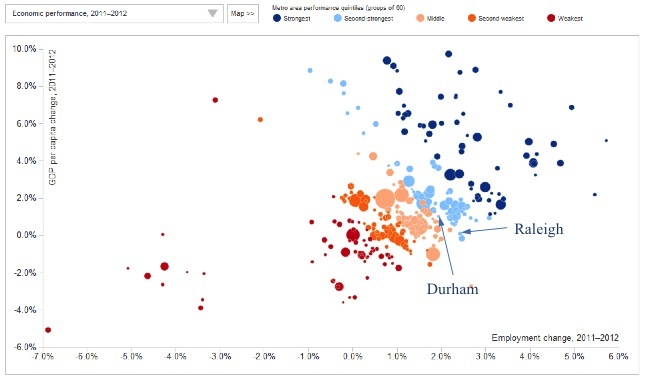 These gains were most pronounced in the core counties of Wake, Orange, and Durham, all of which experienced employment increases of well over 200% in this period (Rohe 2011). 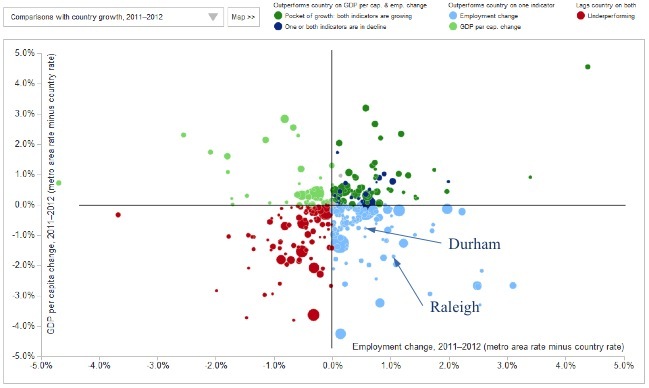 Hence, regional employment growth in the past several decades has correlated with greater proximity to the RTP. Weddle et al (2006) also note that the RTP contributes to the regional economy directly in terms of construction employment and real estate, income and sales tax yields. However, while it is notable that the successes of the RTP have correlated with regional economic growth, it is difficult to establish a causal relationship between the former and the latter. Though the RTP has certainly exerted positive economic effects on the surrounding area, it is unreasonable to conclude that the park is single-handedly responsible for regional economic growth. In the 13-county Triangle area, population increased by 29.2% from 2001-2011, compared to the national average of 9.3% (NCOSMB, US Census Bureau). However, during this period, the RTP shed several thousand jobs. Total park employment began to rebound in 2005 and has continued to grow since, but today’s employment figures are still below the peak of the early 2000s. The rapid population growth in the area despite the park’s decreasing employment in the past decade suggests that other features of the regional economy must have appealed to immigrants. Healthcare and education are two candidates: the two sectors have been the region’s fastest-growing industries over the past two decades (NC Dept. of Commerce). Additionally, the growth of the RTP has certainly not proven to be a panacea for issues of poverty and income inequality that plague parts of the Triangle. In 2009, nearly 19% of Durham city residents lived in poverty, with poverty rates at 25.7% for black and 36.3% for Hispanic residents. In addition, the median household income for white families, over $61,000, was far higher than the figures for black ($33,000) and Hispanic ($38,000) families (City Data). These economic malaises of the Triangle area require solutions that the RTP has proven unable to provide. 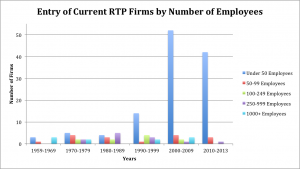 Data have illustrated that in terms of the total number of firms and total employment, the RTP has grown substantially over the past five decades. The park’s 178 firms currently employ around 39,000 full-time workers. The RTP has illustrated a trend in recent decades toward housing an increasing number of smaller, lower-employing firms. As of January 2013, 71% of the RTP’s 178 firms employ fewer than 50 workers, with 43% of its firms employing fewer than 10 (Figure 5). The park appears to be successful in attracting new firms, having added 106 new firms since 2000 and 46 since 2010 (Figures 2,3). Substantial regional economic growth has occurred since the park’s founding, as evidenced by the growth of regional income compared to the national average (Figures 7,8). Yet the RTP faces numerous challenges in retaining its competitive advantage in high-technology employment in the years to come. With less than one-tenth of its total area available for development, the RTP faces spatial constraints that limit its ability to attract the large firms that drove the park’s early growth. Competition for attracting new firms has increased greatly with the proliferation of research parks and development initiatives both domestically and internationally. Moreover, the RTP faces a decline in several of its prominent industries. From 1999 to 2003, the park experienced a 30% decline in employment in the manufacturing of high-technology equipment (Rohe 2011). Additionally, the information technology sector, long a large employer in the RTP, has suffered over the past two decades. The park has lost thousands of jobs in this sector since the late 1990s, as evidenced by the decline of Nortel Networks. The data indicate that the RTP has been fairly successful in attracting new firms with small staffs. However, the turnover rate has been high for these firms. One possible implication of this is that once start-ups mature sufficiently, they find the environment of the RTP undesirable or unfavorable to their sustained growth. The isolated nature of the RTP complex itself might contribute to this pattern. A 1988 survey of RTP firms found that 47% of these companies would not have located in the Triangle area if the RTP had not existed (Rohe 2011). It would be instructive to conduct a contemporary equivalent of this survey to observe whether the features of the park still proved as attractive to firms, or whether firms desired new amenities not offered by the RTP. Moving forward, it remains to be seen whether the efforts to modernize the RTP as a mixed-use complex featuring residential and commercial space are successful in attracting new firms and workers to the park. More fundamentally, further research is needed to determine the role of traditional suburban research parks in housing start-ups and small firms specializing in high-technology fields. The RTP contributed hugely to modernizing the regional economy in the latter half of the 20th century following the decline of traditional manufacturing in the area. Today, the park’s leaders must demonstrate a similar ability to adapt to new trends in employment in order to preserve the RTP’s status as a successful regional employer and engine of economic growth. Data from: “2013 Company Directory.” Research Triangle Foundation of North Carolina. 2013. Source: The Research Triangle Foundation of North Carolina. Data from: Research Triangle Foundation of North Carolina. 2013. 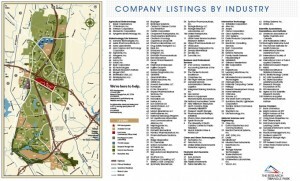 “2013 Company Directory.” The Research Triangle Foundation of North Carolina (RTF). January 2013. De Silva, Dakshina G. and Robert P. McComb. “Geographic concentration and firm survival.” Munich Personal RePEc Archive. Paper No. 32906. 2011. Depillis, Lydia. “Dinosaur Makeover: Can Research Triangle Park Pull Itself Out of the 1950s?” The Atlantic. 12 Oct 2012. 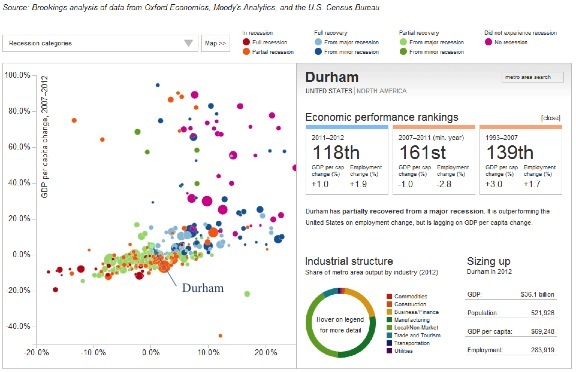 “Durham, North Carolina.” City Data. 2013. http://www.city-data.com/city/Durham-North-Carolina.html. Glaeser, Edward L and Albert Saiz. “The Rise of the Skilled City”. Harvard Institute of Economic Research. Discussion Paper No. 2025. 2003. Goldstein, Harvey. “The Role of Knowledge Infrastructure in Regional Economic Development: The Case of the Research Triangle.” Canadian Journal of Regional Science. Vol. 28, No. 2, Pp. 199-220. 2005. Ioannides, Yannis Melelaos, Henry G. Overman, Esteban Rossi-Hansberg and Kurt Schmidheiny. “The Effect of information and communication technologies on urban structure.” Economic Policy. Vol. 54, Pp. 201-242. 2008. Jenkins, Craig J, Kevin T Leicht and Arthur Jaynes. 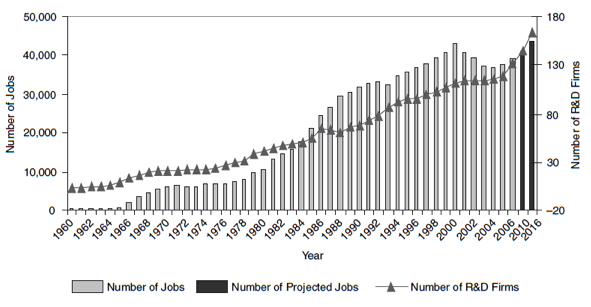 “Creating High-Technology Growth: High-Tech Employment in U.S. Metropolitan Areas, 1988-1998”. Social Science Quarterly. Vol. 89, No. 2, Pp. 456-481. 2008. Kodrzycki, Yolanda K and Ana Patricia Muñoz. “Reinvigorating Springfield’s Economy: Lessons from Resurgent Cities”. Federal Reserve Bank of Boston. Community Affairs Discussion Paper No. 09-7. 2009. “Large Employers/Manufacturers.” The Greater Durham Chamber of Commerce. 2013. http://durhamchamber.org/. Link, Albert N. From Seed to Harvest: The Growth of Research Triangle Park. The Research Triangle Foundation of North Carolina. 2002. Link, Albert N and John T Scott. “The Growth of Research Triangle Park”. Small Business Economics. Vol. 20, Pp. 167-175. 2003. Marshall, Alfred. Principles of Economics. London, MacMillan & Co. 1890. “Metropolitan Statistical Area Data.” Economagic.com: Economic Time Series Page. 2013. Moretti, Enrico. “Estimating the social return to higher education: evidence from longitudinal and repeated cross-sectional data.” Journal of Economics. Vol. 121. Pp. 175-212. 2004. North Carolina Department of Commerce Division of Employment Security. 2013. https://www.ncesc.com/default.aspx. North Carolina Office of State Budget and Management (NCOSBM). 2013. http://www.osbm.state.nc.us/. “The Research Triangle Park.” Research Triangle Foundation of North Carolina (RTF). 2013. www.rtp.org. “The Research Triangle Park (RTP).” Research Triangle Regional Partnership (RTRP). 2013. http://www.researchtriangle.org/. Rohe, William M. The Research Triangle: From Tobacco Road to Global Prominence. Philadelphia. University of Pennsylvania Press. 2011. “State and County Quick Facts: Durham, North Carolina.” United States Census Bureau. 2013. Sternberg, Rolf, Matthias Kiese and Dennis Stockinger. “Cluster policies in the US and Germany: varieties of capitalism perspective on two high-tech states”. Environment and Planning C: Government and Policy. Vol. 28, Pp. 1063-1082. 2010. Wallsten, Scott. “Do Science Parks Generate Regional Economic Growth? An Empirical Analysis of their Effects on Job Growth and Venture Capital.” AEI-Brookings Joint Center for Regulatory Studies. 2004. Weddle, Rick L., Elizabeth Rooks and Tina Valdecanas. “Research Triangle Park: Evolution and Renaissance.” Research Triangle Foundation: IASP World Conference Paper. 2006.